The homes in Winston-Salem are just as susceptible to foundation problems as any other city in North Carolina. When homeowners experience foundation problems in Winston-Salem and are unsure of which way they should turn, they should give Tar Heel Foundation Solutions a call. 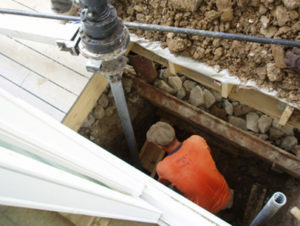 We are available year-round for numerous types of foundation repair, from helical piling installation to wall crack injections. Our top of the line products will keep your home safe and secure for years to come. Nobody enjoys coming home to water in their basement, but having foundation cracks or problems can cause excess moisture and standing water to accumulate in both your crawl space and your basement. This not only damages your possessions but can also threaten your home. Water pressure creates more foundation cracks in your walls and floors and can also provide the perfect environment for mold or mildew growth. Problems like cracked, leaning and bowed walls or moisture in your basement can be corrected with Tar Heel Foundation Solutions’ quality Earth Contact Products (ECP) products. We use only the best helical anchors and helical tiebacks to ensure that you’re getting the best quality repair job. When your Winston-Salem home has cracks in its foundation, your home is at risk. Our foundation repair services are extensive, offering you an array of choices when trying to decide what may be best for your home. 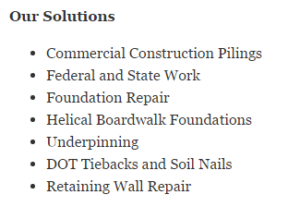 If you’re in need of any foundation repair in Winston-Salem, North Carolina, contact Tar Heel Foundation Solutions for the best service available. No problem is too big or too small. Our qualified staff will assess the damage and find the best foundation repair solution for your Winston-Salem home.